Gar Laboratories, Inc., is an FDA-REGISTERED provider of complete contract packaging services for sun screens, bathe creams, liquids, creams, lotions, soaps, perfumes and colognes. 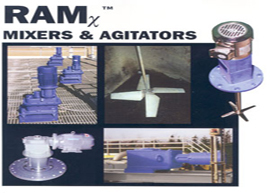 At their facility in Riverside, CA, they produce gels, creams and lotions utilizing a combination mixing vessel that incorporates both scraped surface agitation along with a reversible axial flow high shear rotor/stator homogenizing mixer. The Model CJ-50 Reversible Homogenizer is installed aside of a center line scraped surface agitator that has axial flow paddle bars on both the inner side of the anchor and also along the anchor drive shaft. 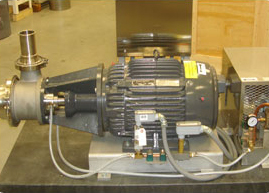 The Reversible Homogenizer is operated in the down-mode. 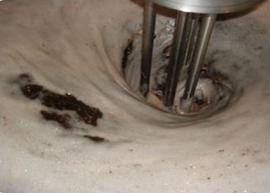 This provides a positive flow down from the top surface of the liquid. The operator can easily add solid powders that float and are difficult to wet out. 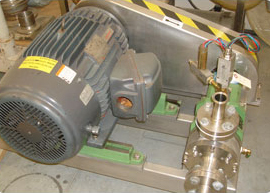 The powders flow down into the high shear mixing head where they are subjected to shear between the rotor and the stator on the axial flow high shear homogenizer. Shear rates ranging from 15,000 to 30,000 reciprocal seconds are possible at the maximum 3600 RPM operating speed. These shear rates can provide fine deagglomeration of powders and also production of fine grain emulsions down to below 1 micron. When the powders are fully wetted out, the high shear homogenizer is operated at 3600 RPM to provide the highest shearing rates to provide emulsions and dispersions. 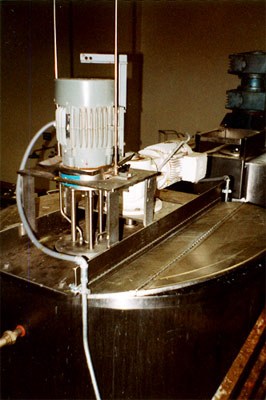 After the homogenization is completed, the speed of the high shear mixer is set to 1200 RPM by reducing the speed with a variable speed invertor. 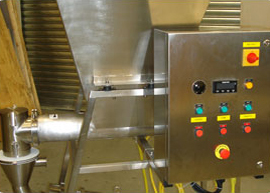 At that point, the homogenizing mixer is not running at a high shear rate that could damage long chain molecules such as carbomer thickeners. This way good top to bottom mixing can proceed even when the viscosities of the mixture are increasing to levels as high as 12,000-20,000 cps. 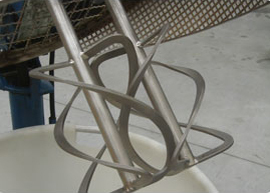 The scrapers on the anchor agitator provide for good head transfer in the critical cooling step when the viscosity of the product increased. By combining high shear mixing with low shear scraped surface agitation, the process vessel is capable of producing a wide range of different products such as are necessary in the contract packaging industry. The down-mode of the homogenizer mixer can easily pull in and wet out floating solid powders. 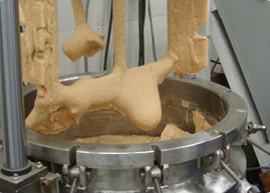 High shear can then be used to produce emulsions and dispersions. Finally, the axial flow capability of the Model CJ-50 gives excellent top to bottom mixing in high viscosities while the scraper agitator is assuming good heat transfer during the cooling step.